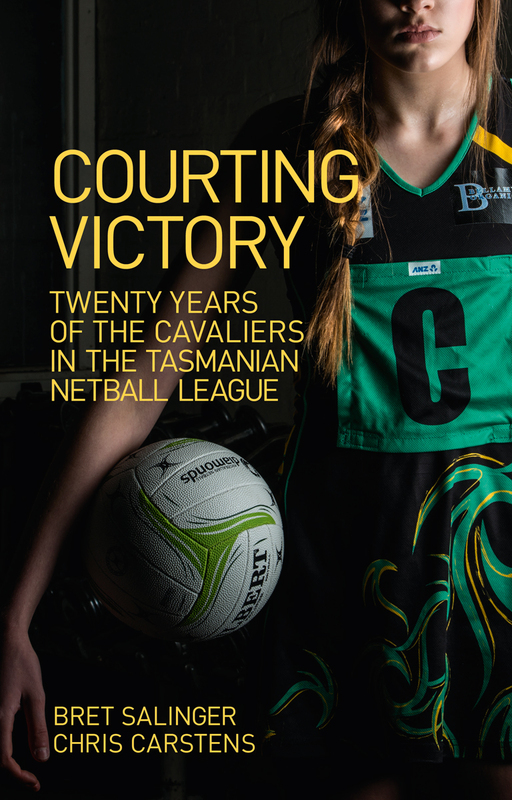 Courting Victory: 20 Years of the Cavaliers in the Tasmanian Netball League was published in 2016. The book was written by myself and Chris Carstens, and tracks the Cavaliers Netball Club’s founding and development into the most successful sporting club in Australia over the past 20 years, winning 16 state league premierships at Open and 19&U levels. The 2011 extra-time preliminary final loss to Cripps-Waratah stung. Really stung. Losing that year’s captain, Sophia Saunders, who moved to Hobart and to the old enemy Cripps was another blow that hurt leading into season 2012, but it wouldn’t be the only pain suffered by the Cavaliers in a season of premiership highs and one remarkable low. The 2012 return of Dannie Carstens as playing coach would serve to both strengthen the Cavaliers’ defensive stocks, and underpin a new era of professionalism that would pay dividends in the years ahead. Dannie returned from London, where she’d kept her eye in during 2011 by spending weekends beating up on hapless English goal attacks in a social netball league. “I was playing in a social competition. I just went on Gumtree and looked up a group to play with. They were called New Generation and we played in the spring roster over there and I think we ended up winning it in the end,” Dannie said. “Their idea of ‘social’ and mine never quite matched,” Dannie said upon her return to the Tasmanian competition, where the name Dannie Carstens was synonymous with physicality and a hard-at-the-ball approach to the sport. Added to the return of Dannie, the arrival of young Burnie-based goal shooter Estelle Margetts to the Open line-up would prove an on-court boon for the Club in 2012 and in the coming seasons. Estelle, unassuming, tall and long-limbed, would represent Tasmania at 21 & Under or Australian Netball League levels in every year from 2012 to 2015 inclusive. Off-court, Pip Rainbow replaced Judy Barnes as Club secretary, while David Thomas, Chris Carstens and Annette Norquay continued in their roles of president, vice-president and treasurer respectively. Marianne Rose returned in the role of primary carer, and would face arguably her biggest trial in the Club’s elimination semi-final against local adversary, the Northern Hawks. Six of the premiership-winning 19&Us Cavaliers returned for season 2012 under the guidance of coach Lynda Colgrave, assisted by Pip Rainbow. Kate Gibson was appointed captain once again, with Sarah Guest, Daisy Jenkins, Kelsie Norquay, Kelsie Rainbow and Lucy Thannhauser (nee Bosker) back for a tilt at consecutive junior flags. Joining the team from Northern Saints was Victoria Briscoe, a tall, rangy goal keeper with a great vertical leap and a huge reach that would be the envy of many boxers. Vic teamed perfectly with Sarah Guest in the defensive circle for much of the season. Up front, Kate Gibson and the combination of Georgie Briggs and India Thomas was something special. Kate, Georgie and India read the play – and each other – perfectly, with the 2012 19 & Under Cavaliers putting on a scoring clinic in many of their matches. Dannie’s return as playing coach and the addition of Estelle up-front were the only changes to the Open squad from the previous year. Sophia’s departure saw Cath Van Keulen assume responsibility as captain, with two deputies in Bree Mountney and Claire Nitschke – recognition that the team had great leadership depth in offence, defence and the centre court. Claire Dennis continued in her role as assistant coach and coach of the development squads, while Donna Jenkins took the manager’s spot. There was a real air of expectation around the Club. The 19&Us had won the previous premiership and were primed for a strong season while the Opens had stability, experience, fitness and sublime skills in their corner. That said, the best-laid plans count for nothing when fate rears its head. At season’s end the Open Cavaliers again found themselves in the finals. They faced an elimination first semi-final against Northern Hawks at the Silverdome. The teams had played twice during the season with a win apiece, although the Hawks’ win the week before the finals in the last round of the season proper was a big one. A loss in the semi-final meant it was season over; a win meant facing Arrows for a spot in the season decider. The undefeated 19&Us team also faced the Northern Hawks the first weekend of the finals, this time in the second-chance second semi-final. For the undefeated young Cavaliers a victory would mean a week off and direct entry to the Grand Final. Taking to the court first, the youngsters bulldozed past their northern opponents putting on another huge score, running away 61-39 winners in an accomplished performance, maintaining their undefeated status. With the young Cavaliers off the court and enjoying the start of a long break, the seasoned Open team took to the broad expanses of the Silverdome in front of a big crowd that was split pretty much 50-50 between supporters of both Launceston clubs. Dannie Carstens and Emma Russell had missed the game the week before and both were welcome additions to a side facing the Hawks, who were making their first appearance in an Open-level final since 1996. “It was in the first quarter at about the 10-minute mark and it was our centre pass,” Dannie recalled. Even now Dannie calls the ankle that she ruptured early in that final her good one because the Achilles tendon in her other ankle still gives her grief with tendonitis. “It was strange actually. I turned around and couldn’t put any weight or pressure on it, went down, and Marianne came out,” Dannie continued. Dannie hobbled off and watched the rest of the game from the sidelines. Though her teammates were rattled by the injury they put together a solid performance, running away with a 12-goal win and confidence that they could cover for the loss of Dannie in the preliminary final. There’d been other injuries for the Cavaliers before, but seldom one at such a stage of the season to such a senior player and with so many implications, both for the remainder of the finals campaign and the year – or potentially even the years ahead. Famously, Linda Bothwell broke her leg in the 1995 campaign attempt for the then newly-formed Cavaliers to make the grade as a State League club. Barb Prewer remembered Linda Bothwell’s broken leg as a disaster, saying the goal shooter and playing coach had put her reputation on the line coming to the Cavaliers in the early days of the Club. In 1997 Tammy Towns suffered a major injury in the season’s opening match, and in early 1999, 19&Us players Lauren Galea and Esther Crick both went down with major injuries, finishing the pair’s seasons. Later, during the early 2000s, then 17-year-old Hayley Kerrison was playing in the local competition on a Friday night for her team in the NENA roster when she ruptured her Achilles tendon, curtailing her Cavaliers campaign for the year. Sadly, in 2015 she ruptured her other Achilles while still going strong on the courts of northeast Tasmania. In 2004 Janelle Harris was injured in the first quarter of the 19&Us Grand Final causing a reshuffle of players, while in the 2011 finals campaign Emma Russell rolled her ankle in the lead-up to what would prove to be the last game of the Open season – the extra-time preliminary final loss to the Cripps. Kelsie Rainbow started season 2014 under a fitness cloud with persistent tendonitis in a knee ligament. The ligament started to get weak and cause her plenty of pain but Kelsie, ever the hard worker, pushed on through the long grind of pre-season. However, by the halfway mark of the first game of the year her season was over and rest was ordered. Also in 2014, Open captain Savahn Overall had surgery on her hand and missed a major chunk of the season before returning to lead the Club into the finals. Over the journey, there were plenty of Cavaliers who were no strangers to pain. Dannie bravely returned to coaching three days after surgery, but the 2012 Open season ended in a spluttering halt with an ignominious 16-goal preliminary final loss at the hand of Arrows. Hobart’s Netball & Sports Centre was as cold as usual for the 2012 19&Us Grand Final between the undefeated Cavaliers and the Northern Hawks, who had bounced back from the semi-final loss to overcome Kingston and force another meeting with the Cavaliers in Hobart. The Kate Gibson-led squad started the game strongly and didn’t look back, running away with a 53-27 win in a 26-goal victory that mirrored many of the results throughout the year. Fittingly, Kate was awarded player of the match for her powerhouse performance up forward. The result was a second successive Tasmanian Netball League premiership for the 19 & Under Cavaliers and a second season without a loss in what was fast becoming a stellar period for the Club and its junior side. It was also recognition of the Club’s commitment to its junior development program. Following the Grand Final success for the 19&Us team more plaudits came at season’s end when, in an historic first for the league, every single position in the Tasmanian Netball League’s 19&Us All-Star team was filled by a Cavaliers player. The selected players were Georgie Briggs (GS), Kate Gibson (GA), Lucy Thannhauser (WA), Kelsie Rainbow (C), Sarah Guest (WD), Kelsie Norquay (GD), and Victoria Briscoe (GK). Topping off the list of junior accolades Kelsie Rainbow was selected as TNL Coaches Player Most Wanted, and coach Lynda Colgrave was selected as the 19&Us Coach of the Year. In the Opens, Emma Russell was awarded equal Tasmanian Netball League Best & Fairest with the Cripps’ Emma Williams. Emma Russell was also selected as centre in the TNL Open All-Star team, along with Cath Van Keulen (GA), and Dannie Carstens (GD).